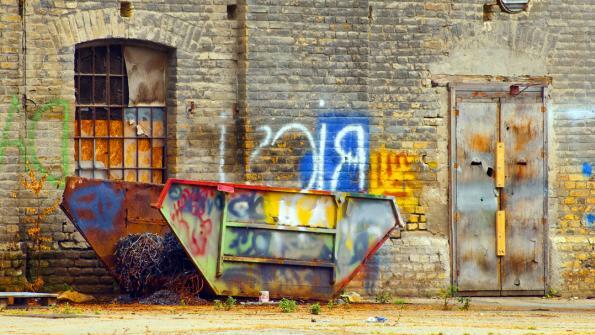 Cortec’s MCI Wall Defense is a clear, silicone elastomer-based anti-graffiti coating. It can be applied to exterior concrete, masonry, or metal surfaces. Use it to protect roadways, bridges, railcars, and other publicly and privately owned spaces. Use Cortec’s MCI Wall Defense to protect roadways, bridges, railcars, and other publicly and privately owned spaces from painted vandalism. The product is a clear, silicone elastomer-based anti-graffiti coating that can be applied to exterior concrete, masonry, or metal surfaces. It is designed to be used over various types of surfaces that are coated or uncoated. The permanent coating does not need to be reapplied after graffiti removal like some alternative products. MCI Wall Defense, however, can be recoated over itself, while other coatings, tagging, or graffiti will not stick. The product’s graffiti resistance starts to work 24 hours after coating. The product may be applied by spray, brush, or roller. A film thickness of 12-15 dry mils (300-375 microns) is recommended. The coating dries to touch in 2 hours. Any tagging is removed with a cold water pressure cleaning of about 1,200 psi; no special cleaning agents are needed. Cortec Corp. provides environmentally responsible VpCI and MCI corrosion control technologies for Municipal, Highway, Packaging, Metalworking, Construction, Electronics, Water Treatment, Oil & Gas, and other industries.